Simar Pannu is a professionally qualified Corporate Lawyer. She went to the Army Institute of Law and did BA LLB from there. She worked with an international law firm called Clifford Chance OSC Services which is based out of London. She worked there for a year and then decided to pursue her passion which was makeup. She went to Delamar Academy in London to do makeup courses and satrted working as a makeup artist. A Makeup Artist can make your day. You need them for your Big Day, you need them for your Fashion show, TV of film. Everyone who looks good on TV, in camera or on person the person behind that is Makeup Artist. 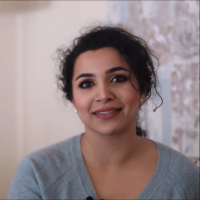 "After completing BA LLB from Army Institute of Law, I satrted working at an international law firm Clifford Chance OSC Services which is based out of London and worked there for a year and then decided to pursue my passion which is makeup. I went to Delamar Academy in London which produced many famous makeup artists that were working in sitcoms like Game of Thrones." Corporate law (also known as business law or enterprise law or company law) is the body of law that applies to the rights, relations, and conduct of persons, companies, organizations and businesses. "I am a professionally qualified corporate lawyer. I went to the Army Institute of Law and did BA LLB from there. After that, I worked with an international law firm called Clifford Chance OSC Services which is based out of London and worked there for a year."